Charity is believed to be a form of blessing,inner satisfaction you receive when you help the needy. Charity may not be necessarilyin the form of money all the time, but it could also be in the form of kindness. A little charity could get a big smile to someone. We as a team at eTravelSmart strongly believe in the concept of "Charity" and hence have directed our efforts to help the merit/intelligent students who do not have access to "Quality Education". BEGES is one such NGO with whom we collaborated to support the needy. Though less, but every rupee that our customers support through charity enables hundreds of students to achieve/realize their dreams of getting access to "Quality Education". 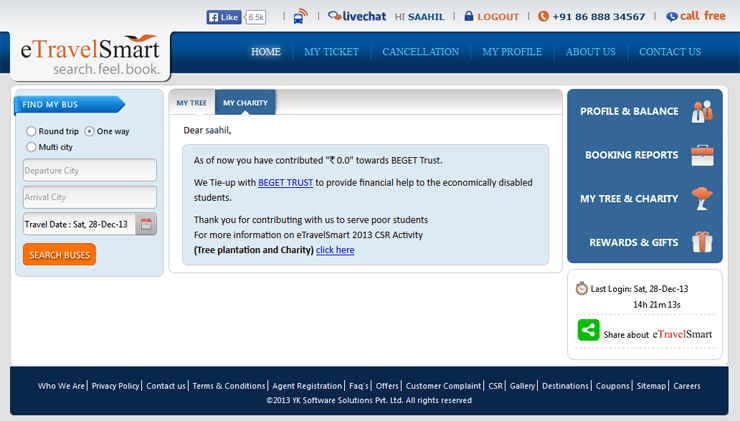 Please find our commitment towards this charity initiative in "gallery" link on eTravelSmart website. As we believe in accountability & responsibility for each & every rupee collected from our customers, a half-yearly report is published for transparent collection & spending of money. Support students of nations by contributing minimal amount to BEGET trust.